This model of a heart-shaped diamond cathedral engagement ring, with accent gemstones, and unique prong setting, was designed by request for a friend on DeviantArt. The model consists of 9,602 polygons, and 9,592 vertices. There are no textures with the model, but all the parts have been UV unwrapped, and work well with any procedural material. 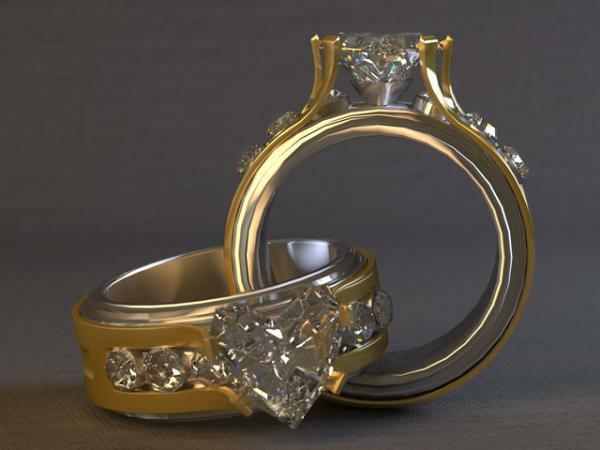 I strongly recommend using physically accurate diamond or gemstone materials, and metals. Beautiful Set of rings! Thank you so much! Callad (5 years ago) Inappropriate? SpookieLilOne (5 years ago) Inappropriate? Bri65 (5 years ago) Inappropriate? It's gorgeous! Thank you so much for your generosity. A masterpiece (no joke; I know a bit about jewelry). Many many thanks. OrishaShango (5 years ago) Inappropriate? Finally I got my grubby lil hands on a fantastic piece of work from you! Can't wait to just render it in Poser. Thanks! Philemo (5 years ago) Inappropriate?